I’ve mentioned before that Little has a lot of clothes because I can’t stop buying she outgrows them so quickly at this age. Add to the clothes all of the other miscellaneous items required for being 8 months old and you have all the elements for an organizational nightmare. I tend to be a fairly well organized person and clutter usually drives me to the brink of insanity, but I just haven’t been able to get my arms around Little’s closet yet. In an effort to be motivated and inspired toward getting this area under control, I’m going to join up with the 30 Day Organizational Challenge at I’m an Organizing Junkie. Thanks, Laura, for getting me up and going for a good Spring cleaning. I will be focusing on the closet, but the organization will, by necessity, include other areas of her room. You can tell by the pictures below that clothes have kind of taken over the place and now must be contained. There are a few issues in dealing with her space: her room is quite small (meaning no room for an additional piece of furniture), her closet is quite small, there is an existing “closet system” in place that I need to work around, I would like for the system I choose to grow with her to some extent. There are also many things that must be organized into her closet and room. This includes: storage for dirty clothes, outgrown clothes, and not-yet-grown-into clothes; neat and accessible storage for the clothes, shoes, socks, etc that she is currently wearing; a place to contain clothes that will go to charity, consignment, or on eBay; items we are storing until we can give them back to the rightful owners (on loan hand-me-downs); a place for sheets, burpies, bibs, blankets, etc. ; a place for bath stuff, safety stuff, medicine, and other items that need to be accessible but out of Little’s reach. If you have any comments or suggestions, please leave them below. I would love to hear some other ideas for the space. For more information on the challenge and to see what others are setting out to conquer in 30 days, click on the picture below. Every month I have to clean out Bubbie’s drawers and closets so that I can clear out the clothes that don’t fit any more! We had baskets under the changing station and that didn’t help after a while. We finally got a bookshelf and it works great! I love Little’s closet organizer!!! I wish I had one like that! Give her kisses for us! Wow, that closet has some great potential! Get a few cute baskets to corral the stuff and you’ll be in business. It will look so good you won’t want to shut the door. Hello! 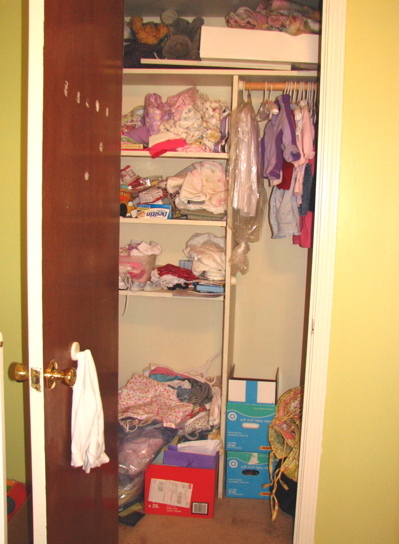 Your daughter’s room doesn’t seem to be too bad but it does appear the closet isn’t being utilized to the best of its ability. I love the suggestions of your first commentor. Excellent ideas! Definitely baskets on the shelves and a double hanger. Store her laundry hamper in her closet under the shelves and you could even have some totes there labelled for ebay and consignment ready and waiting for outgrown clothes. I really can’t wait to see what you come up with. Good luck and thanks for joining in!